CLEAR FORK VALLEY — Kids attending a summer camp outside Butler and Bellville are learning an important life lesson. “You’re going to fall,” says adventure camp director Hans Brenhorst to the kids at Ohio Dreams. A crew of kids goes to week long sessions at the camp, where they can use scooters, bmx and mountain bikes and skate boards. Plus they can go rock climbing on a wall and participate in activities in the woods surrounding Ohio Dreams buildings. If kids wear pads they can slide on their knees and learn to not land on their limbs, which sets them up for a “break the bones” situation. 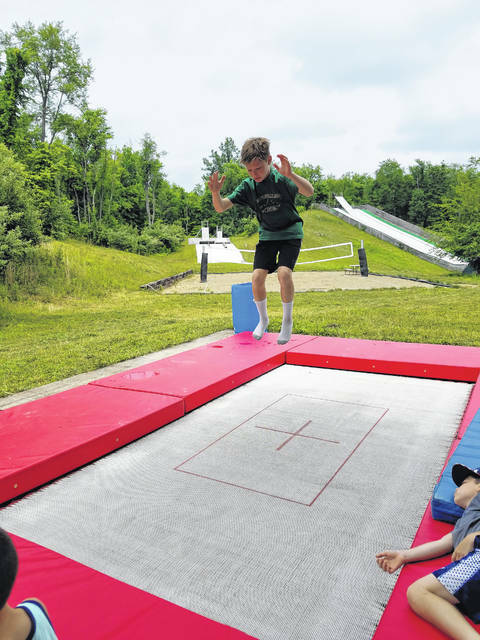 Kids at adventure camps are different from those in active sports camps, where kids sometimes can meet and learn from Olympic veterans, said Justin Travis, of Ohio Dreams. There have been four Olympians attend Ohio Dreams active sports camps, where kids ski, go snowboarding and ride bmx bikes. At adventure camps, the idea is to draw in more people locally. Many people who go to the active sports camps at Ohio Dreams come from locations all across the country, said Travis. At the adventure camps, awards are given each week. One is the “tough as nails” award, given to the kid who has fallen and gotten up the most. A “spirit of adventure” award goes to the person who willingly will try anything. One recent award was for “conqueror of most gruelling of trials.” Brenhorst says this falls into the category of an occasional “random award,” when staff members see someone doing something exceptional. Some offerings at the camp can be intimidating, Brenhorst said. There is one skill Brenhorst, an experienced skate boarder, hasn’t been able to master. This involves grabbing baseballs suspended on a chain, then swinging onto another suspended set. Brenhorst said a few kids who have come through have been able to do it. These kids are “pretty good athletes,” he said. This week an afternoon session had the kids going down a giant slide into a pool, then working out on trampolines. Later the kids were going to be doing Ninja warrior operations in the woods. One young man who said he was 10, said he wanted to come to the adventure camp because his mother had shown information about a “slip n fly” event. There was also information about the bmx bike course. This young man, who seemed to be getting expert at back flips on the trampoline, said he didn’t wish to be identified. But he was willing to keep on trying to perfect his skills. He said he thought at first he wasn’t sure about camp, because he had gotten “scared to sleep away” from home. Young Cole Wright, 13, of Westerville, also was practicing trampoline back flips. Like all the youngsters in his group, his moves weren’t quite at the perfection stage. But that didn’t stop him from continuing his efforts. The adventure camps have the kids stay at Ohio Dreams for one week. The cost is $599, but there is a $200 discount for any kid from Richland County. Travis said the idea was to draw more people to the camp, and the effort is working. The Clear Fork valley area draws many people seeking outdoors activities. Hidden Hollow camp, located on Possum Run Road, also has camps for children.